Where do I find this wonderful tattoo shop you might ask, well here it is. A.W.O.L. 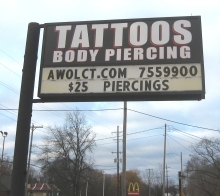 Custom Tattooing, LLC is located at 1780 W Sherman Blvd, Muskegon MI, 49441 (toward the lake from most of Muskegon). We are positioned between J&M Machine and K's Bubble Brush, and across the street from Mango's Restaurant. Click for directions from Downtown Muskegon, Ludington, Grand Rapids, Holland, Detroit, and Chicago. If you are coming over on the Lake Express ferry into Muskegon from Wisconsin click here. Before coming from any sort of long distance please call and schedule a consultation appointment with or without allotted time for actual tattooing.